The assessment produces a unique Susgauge flower for each organisation showing at a glance how sustainable they are in different areas. The school, company or community then decide their priority areas for action, and work with the help of Engauge specialists to become more sustainable. Sign up on this site with your name, organisation and email address to be notified on updates to Engauge and sustainability issues. One school wanted to tackle their water consumption and reduce their water bill. An Engauge water specialist took detailed meter readings, looked at where usage could be reduced and efficiency improved, and gave a classroom session that included a demonstration of how toilets work. Another school wanted to know if their school uniforms were ethically produced. An Engauge purchasing specialist helped them ask the right questions and understand the information given by the different suppliers. The Susgauge is a self-measurement tool. It provides schools, businesses and communities with a simple overview of their current social, environmental and economic performance in nine areas of sustainability and enables improvement and achievement to be clearly demonstrated. The Susgauge is represented by the diagram of the Susgauge flower with the nine areas measured – the Susgauge 'petals' and the stem. The Susgauge measures your achievements in all these areas, by answering questions about each of the subjects you score points. 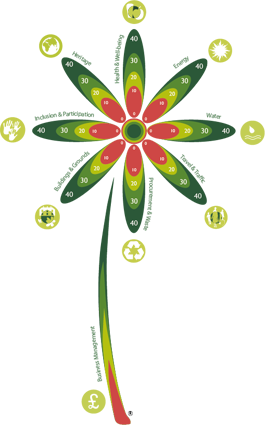 Each petal can score up to 40 points and with the inclusion of the stem (also 40 points), the Susgauge assessment provides a maximum of 360 points. You can obtain your unique Susgauge score by satisfying the criteria in each of the petals displayed. This will show you where you are strongest and where you need to make improvements. Schools in West Sussex, London and across the south east have signed up to ‘Engauge’ — an initiative which helps schools improve their sustainability across a whole range of environmental, health, social and financial issues. Could YOU work in and with schools to provide just that little bit of extra help they need? Local authority officers from various departments, (not just the ones schools usually talk to). Petal Specialists who are local, with the appropriate insurance and CRB cover. and who have demonstrated a commitment to balanced development in their own fields of work. Educators, such as former headteachers, governors, and bursars, university lecturers and schools liaison specialists. Seedpacks are information packs, designed to help you to manage improvements and 'grow' your Susgauge score. Linking directly to the respective Susgauge questions, they provide simple definitions with suggested practical actions, links to supporting agencies and possible sources of funding. These have been written and developed by our team of specialists who are also available to help you.